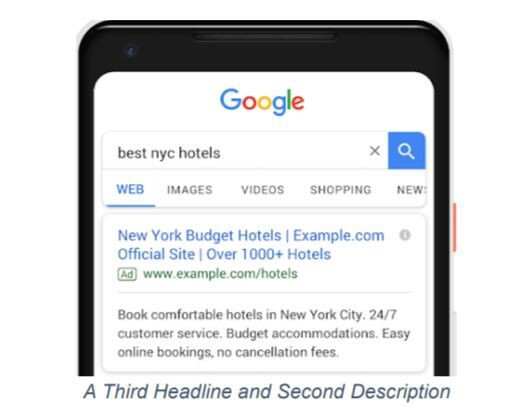 Google recently introduced further extending text ads by adding a third, 30-character headline, attached to the first two headlines, along with a second, 90-character description. This comes at the heels of Google announcing their “360 Suite” where we saw Google Adwords get a rebrand. This allows us, as the advertiser, to more prominently feature exciting benefits to the consumer with added messaging that enhances overall quality. Advertisers now have the flexibility to communicate added messaging like the brand name in the first headline, official site or similar in the second headline, and a third benefit, like free shipping or an offer for discounted orders online. Google also announced the launch of responsive text ads, which combine an ad in real-time from a list of up to 15 headlines and 4 descriptions…we’ll discuss this in more detail below. Expanded text ads, along with ad extensions, like site links and call extensions, work in synergy to increase overall ad size and perceived value in the SERP. Google’s case studies are evidence for increased performance — praising expanded text ads for helping to increase user engagement through higher click-through rates and increases in other key performance metrics. With a further increase in ad size and messaging, Google’s expansion to additional messaging in ads creates more weight to paid ads displaying prominently. It’s a bullseye for brands looking to literally be front and center at the top of the SERPs. 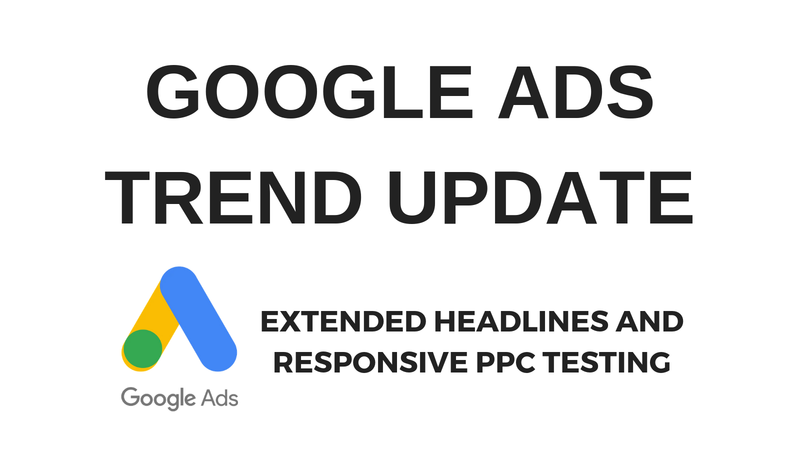 Google’s exciting announcement is the launch of new responsive text ads. Responsive text ads answer the machine learning puzzle that has become more integrated with Google’s automated algorithms throughout the years. Machine learning is designed to predict which ad combination in real-time will result in higher performance for a matched search query. The recommendation from Google is for every ad group to have at least 3 ads, including a responsive search ad to accommodate and increase the likelihood that you’ll have a winning combination between all variant ads, headlines, and descriptions. Responsive ads are a win-win for the advertiser and searcher. They provide freshness through instantaneous Ad combinations to the eyes of return visitors familiar with the brand and new visitors alike that are “window shopping” at leisure in the SERP. • Keep in mind that headlines and descriptions may appear in any order. • Try writing the first 3 headlines as if they’ll appear together in your ad. • Be sure to include at least one of your keywords in your headlines, and create headlines that are relevant to the keywords you’re targeting. • Try creating headlines of different lengths; don’t try to maximize the character count in every headline. • Focus on providing as many distinct headlines as you can. More headlines give Google Ads more options for assembling your messages into relevant ads, which may increase performance. • If you can provide even more headlines, try creating variations of the headlines you’ve already entered. For example, try a different call to action. With more Google Ad options your PPC Ads can become more sophisticated and targeted to your consumers. What do you think about these new changes? If you want to read about more Google Updates, check out our 2018 SEO Google Trends post.